It is a recognized rule in this game that he who loses most and is most frequently unhorsed, is judged the most valiant and the stronger. Tournaments and jousts are the great celebrations of chivalry, and as a knight you will be an enthusiastic participant. These events will offer you opportunities to demonstrate your skill in the use of arms. Geoffroi de Charny may explain that the greatest honour is to be won on the battlefield, but battles are, in fact, quite rare, and your deeds may well go unnoticed in the chaos and confusion. You will find it much more satisfactory to prove yourself in tournaments and jousts. Even if you don’t win, you can gain a reputation for courage and gallantry as you are thrown from your horse. To be successful on the tournament circuit involves considerable expenditure, as de Charny acknowledges, for you will require good equipment. You need to be tough, strong and skilful, and if you do well, you will win great renown. It is impossible to imagine that it will ever be possible to win such fame in any other sport, such as, say, football (a game for peasants). Tournaments are not what they used to be. In the 12th century, in many cases they amounted to arranged battles. There would be a massed charge at the start, followed by a mêlée. Large numbers, perhaps even up to 3,000, were involved; knights could be captured and ransomed for profit, horses could be taken as booty. Fighting was serious, and took place over large swathes of countryside. Tournaments still take place with fighting between groups of knights rather than individuals, but the numbers are not as large as in the past, and the contests are normally held within a confined area. There are various ways in which the fighting at a tournament can be organized. You might, for example, find that a wooden castle is constructed, which one group has to defend. It may seem when you are in the thick of things that there is very little difference between a tournament and a battle, but because there should be no involvement of infantry troops you will not have those dreadful arrows to fear. You are less likely to be killed in a tournament than in battle, and you should not have to pay a ransom if you are on the losing side. Tournaments can be valuable practice for war, even if you use rather different equipment. The event needs to be proclaimed and advertised, and judges have to be chosen. The banners, helmets and crests of the participants should be displayed. The two sides who are to fight need to be selected, to make sure that they are equal. There are festivities, with much dancing and drinking, and a parade of the participants, over the two days before the actual contest begins. They feel the blows though the breast-bone. They hew at the helmets to shatter them. Out bursts the blood in stern streams red. The best blow of all (the ‘man of the match’ award). Keeping a helmet on the longest. There are different forms of mock battle such as the béhourd, in which lighter, blunted weapons are used, and relatively flimsy armour, usually made of leather, is worn. These are less serious occasions than tournaments proper, but they give you a good chance to practise your skills. The joust is an individual conflict between two knights; it is distinct and different from the tournament. It will often be agreed that there should be three rounds; the two men ride at each other, aiming to pass each other on the left-hand side, and to strike each other with their lances. This began to be popular in the 13th century; jousting frequently takes place before the tournament proper begins, often on the previous day. A particularly famous jouster of the past was the German knight Ulrich von Liechtenstein, who wrote up his experiences in verse. Ulrich, rather unusually, enjoyed cross-dressing, and described a journey he made dressed as the goddess Venus, during which he took part in innumerable jousts and tournaments, all for the unrequited love of his lady. And all I had was of the best. Were rather dear, I’ll tell you that. Ulrich was eccentric in other ways. On one occasion he even ordered a bath, during which two pages poured rose petals all over him, an experience which, curiously, he seems to have enjoyed. If you are considering taking part in tournamets under a pseudonym, then that of Ulrich would be a good one to choose, but it might be better to claim to come from Gelderland rather than his real homeland of Styria. Scoring systems are complex, and will vary from event to event. In jousting, the top score normally comes for unhorsing your opponent; breaking your lance is the next best action; striking your opponent on the helmet comes third. The tournament’s overall prize, the ‘man of the match’ award, will be given to the knight who has most distinguished himself, and there may well be differing views on that. It could be that someone who has been unhorsed several times has shown conspicuous bravery, and deserves to be well rewarded. There is a lot of technique to learn if you want to be a skilled jouster. Controlling your horse properly is important, but it is not easy with so many things to think about at the same time. You have to make sure that your horse takes a straight line, and does not veer off course, or even worse, cross in front of the other jouster. In Spain they have taken to erecting a barrier between the two jousters, so as to avert this, but no one has yet thought of introducing it in France or England. Do not be tempted to impress by using an oversized lance: if you strike a low blow with a heavy lance, and your opponent strikes you a high blow with a lighter lance, he will unseat you. A medium-sized manageable lance will be much better than a great big one that will unbalance you and pull you out of your saddle. Your horse will go much better if you have a lighter lance. Think about what your opponent is doing, and adjust your own tactics accordingly. It is tempting to close your eyes just before the moment of impact. Don’t do this. Be careful not to turn your shoulder away; Edward Beauchamp made this mistake in a joust in 1381, and was knocked off his horse as a result. I struck him in the collar then. Sir Otte almost took a spill. Ride upright, with long stirrups, holding the reins in your left hand. Use a lance of manageable weight. Make sure your helmet is on straight, and that you have a good line of sight. Hold your lance in the palm of your hand, not just with your fingers. Do not let the tip of your lance tilt up or down. Do not twist, or turn your shoulder. If your opponent always aims for the same place, vary your own tactics. Keep your eyes fixed on the target, not on the tip of your lance. A good example of jousting is the notable set of encounters that took place outside Calais, then as now in English hands, over a month in 1390. Do not get involved in something of this sort unless you are really expert. Three Frenchmen, Boucicaut, Renaud de Roye and the lord of Sempy, set up camp at St Inglevert, and announced that they were ready to combat anyone who accepted their challenge. Two shields were set up, one to symbolize jousts of war, and the other jousts of peace (which would take place with blunted weapons). Challengers had to ride up and strike one of the shields. This was during a period of truce; the occasion was part sporting event, part incident of war. About a hundred English challengers appeared, all selecting to fight jousts of war. There were doubts that the three Frenchmen were strong enough; it would need great stamina to fight so often. 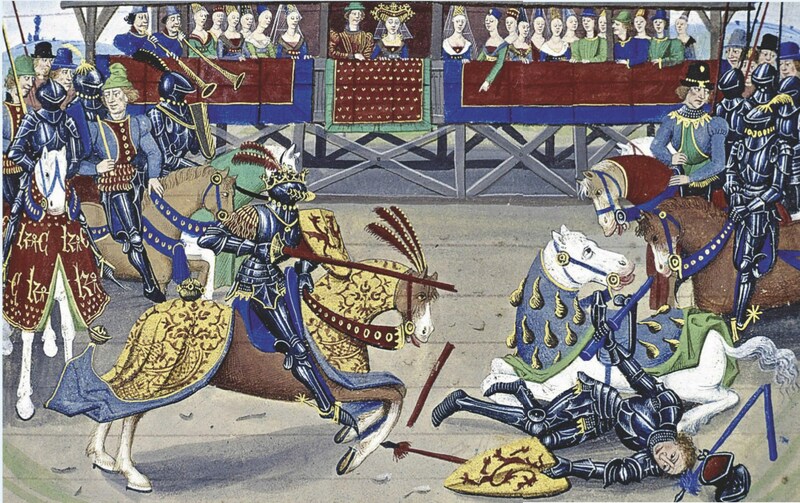 In the event, both Boucicaut and Roye were so badly bruised in the course of the jousts that they had to rest for over a week. Round One. Each man struck the other on the helmet. Round Two. Each man hit the other’s shield; both dropped their lances. Round Three. Each man hit the other high on the helmet, striking sparks. Round Four. The horses failed to go straight. Round Five. Both men broke their lances. Round Six. Each man hit the other on the helmet; both helmets came off. There was no provision for a tie-break; honour was equal, and the two knights were greatly praised for their achievements. The jousting at St Inglevert was accompanied by grand dinners and much festivity; this was a great social occasion, as well as a supreme test of skill and endurance. By the end of the last century, challenges to fight were being issued involving not just jousting on horseback, but a range of military activities, notably fighting with swords, axes and daggers. Nowadays, a combat often takes the form of four rounds, each using a different weapon. In 1377 a tournament took place on three sites, St Omer, Ardres and Calais, between 12 knights from England and Hainault, and 14 from France. There were to be separate rounds on horseback, and on foot with lance, sword and dagger. You may be tempted to take part in an event that offers a supreme test of your skills in the use of weapons, but be careful. This sort of fighting can be dangerous, and perhaps because of this, challenges often end in lengthy arguments rather than actual combat. In 1400 an Aragonese squire, Michael d’Orris, issued a challenge to the knights of England. He had vowed to wear an uncomfortable piece of leg armour until he had fought an English knight. He set out the terms of the fight in detail. Ten strokes with the battle-axe, without intermission, and when these strokes have been given, and the judge shall cry out ‘Ho!’, ten cuts with the sword to be given without intermission or change of armour. When the judge shall cry out ‘Ho!’, we will resort to our daggers and give ten stabs with them. Should either party lose or drop his weapon, the other may continue until the judge shall cry out ‘Ho!’. After the fight on foot, the two opponents were to joust until one fell, or was so wounded he could continue no further. John Prendergast accepted the challenge, but, there being no postal service, letters were delayed, and arguments ensued. Insults began to be traded. ‘I hold your conduct as very discourteous and ungentlemanly’, wrote d’Orris. Prendergast finally demanded £333 expenses from the Aragonese, and, some four years after the initial challenge was made, the matter was dropped. No fight ever took place. It is better not to get into such arguments to begin with. Tournaments are sometimes disapproved of by governments and the Papacy; they can be seen as a dangerous distraction. That is the English king Henry V’s view today. Even Edward I, a keen participant in tournaments in his youth, prohibited them when he considered that they were drawing knights away from his war against the Scots. It was impossible, however, to prevent such popular events from taking place, and in 1316 the Papacy gave up trying and withdrew its objections. In 1338 Philip IV of France banned tournaments during the war with the English, but Edward III, in contrast, gave them his full encouragement. He considered them a way of encouraging knights and nobles to join in his royal enterprises. Alfonso XI of Castile was another enthusiast for tournaments, regarding them as useful practice for war; one was to take place at every meeting of his knightly order of the Band. In 1331 a tournament was held in Cheapside in London which began with a procession in which maidens led knights dressed as Tatars through the streets. In 1359 Edward III and his sons, together with a group of nobles, dressed up as the mayor and aldermen of London for a tournament. In 1362 a Cheapside tournament saw seven knights dressed as the Seven Deadly Sins jousting against all comers. The fashion for staging tournaments with historical or mythological themes probably started in the Low Countries, where they developed as civic festivals. If you attend an event billed as a ‘Round Table’, however, you will probably find that scenes echoing the Arthurian past are played out. At these in particular, drinking and dancing are much more important than fighting. Increasingly, the show and the spectacle seems to be taking over from the sport, and you may find that you are spending more on fancy dress than on proper equipment. Tournaments are used to celebrate great royal occasions. The entry of Queen Isabeau to Paris in 1389 was marked by much pageantry, and by a tournament involving 60 knights. Unfortunately the horses’ hooves kicked up so much dust that it was hard to see what was happening, even when the ground was watered for the second day’s events. The conclusion, however, was more satisfactory, for it took place indoors, in a great hall built for the purpose. There Boucicaut and other knights entertained the ladies by jousting for two hours. London, 1390. A horn with gold mounts; a greyhound with a gold collar; a gold circlet; a gold belt. Florence, 1406. A silver-gilt lion and a velvet cap; a helmet with a silver dragon’s head; a jousting helm with two wings decorated with coloured feathers. You can also win horses, though not as the main prizes. If you manage to strike your opponent so that he comes completely off his horse, the animal is yours. Equally, if you are struck with a foul blow, you can claim your opponent’s horse. What happens if both you and your opponent come off is a moot point and so open to debate; this was a problem set by Geoffroi de Charny, but his answer is not recorded. John Mortimer was killed in a tournament in 1318. In 1344 Raoul, count of Eu and constable of France, died after being struck by a lance in the jousts held to celebrate Philip VI’s marriage. William Montague, earl of Salisbury, killed his own son in a tournament in 1382. It is not just lances you must watch out for, however – there are dangers in the festivities that accompany tournaments too. Even fancy dress can be hazardous. In 1393 the king of France and several of his courtiers dressed up as wild men. One of them was accidentally set on fire by a torch, and several perished in the conflagration. Health and safety is not what it should be in the French court. This entry was posted in History, Medieval battle by MSW. Bookmark the permalink.